I'm not an Abercrombie & Fitch kind of guy. That's partially because I'm old, and partially because I lack style. My idea of dressing up is blue jeans and a clean tee shirt. I don't even like the idea of wearing a shirt with the company's name emblazoned on the front. The Abercrombie & Fitch crowd always struck me as walking billboards. No thank you. About six months ago, my oldest son gave me three sweatshirts he had outgrown. One of these shirts was an Abercrombie & Fitch hoodie that fit me perfectly. I was wearing a hand-me-down from my firstborn and I was cool with that. Initially, I was turned off by two details: the aforementioned Abercrombie & Fitch emblazoned across the front, and the faux wear and tear I've always hated. This hoodie was sold to look like it had been worn roughly for years. You've got to earn those scars, you can't buy them off the shelf! But I kept wearing this hoodie. I kept wearing it because it was from my son, fit perfectly, and is ridiculously comfortable. 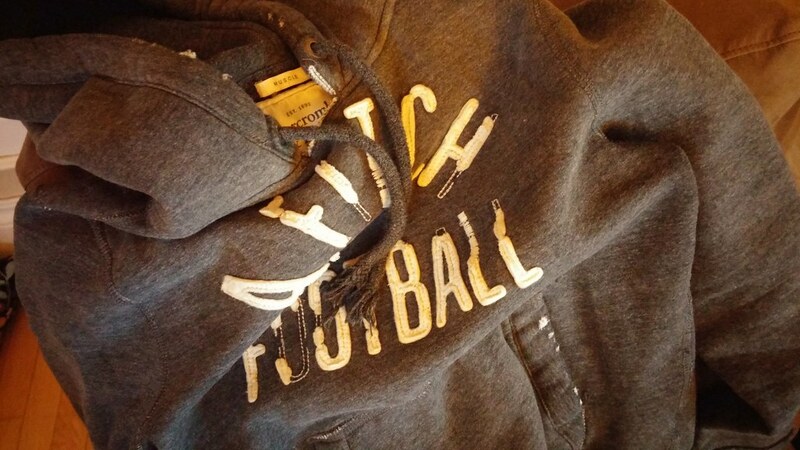 In fact, when I'm wearing another sweater, I miss this Abercrombie & Fitch hoodie. Nothing else feels as soft and warm. No other sweater in my collection comes close. It is, without a doubt, the greatest hoodie I've ever worn. Mike nothing comes close when your son passes down clothing to his Dad. I still wear on of my sons Ottawa Gee Gees baseball shirt from when he played in 2011 in his 1st year & also wear my other sons IBHL (Indoor Ball hockey Lg.) shirt from 3 years ago. They also feel soft & warm because they came from family. The only hoodie I own is a Sons of Anarchy hoodie I was given as a birthday gift. But I can't wear it anywhere but at home. I mean really Sons of Anarchy?